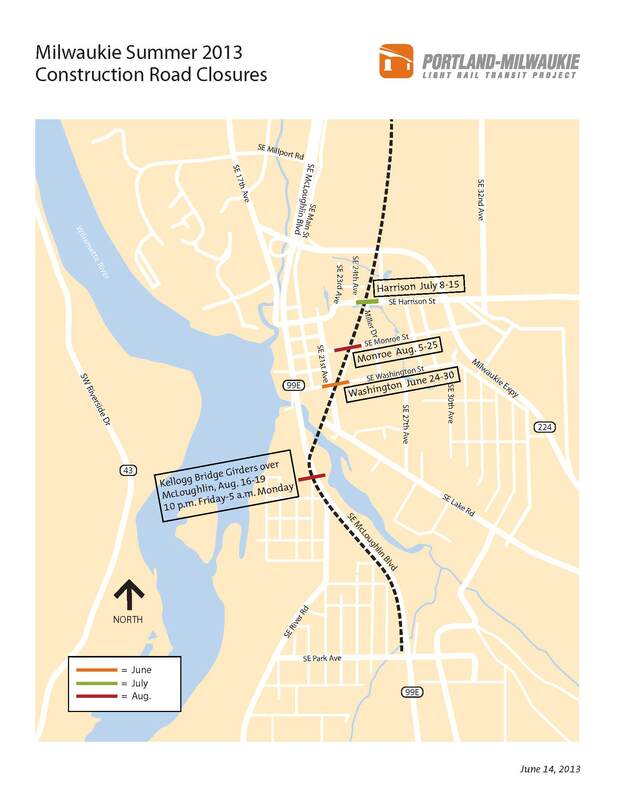 Over the summer, Portland-Milwaukie Light Rail Transit Project construction will require temporary road closures and detours at a series of rail crossings in downtown Milwaukie. The construction includes installing wider/new sidewalks and roadways, installation of light rail tracks and upgrading underground utilities. It will also result in safety improvements to the rail crossings that will allow the City of Milwaukie to apply for a quiet zone where train horns will only sound if there is an immediate safety issue. Further safety improvements at each rail crossing will be installed by the light rail project as the project progresses; these improvements are necessary for the City to acquire approval of their Quiet Zone application. Once approved and all safety measures are in place, the quiet zone operation would go into effect prior to the start of light rail train service in September of 2015. Monday, June 24 at 7 a.m. through Sunday, June 30 at 5 p.m.
Closure of SE Washington Street between 21st and 23rd Avenues for the installation of heavy rail and light rail tracks Traffic may back up onto 99E, so drivers should be prepared for delays through the area. Four bus stops on Washington between SE 21st and 25th Avenues will be closed. Buses will be detoured from SE Washington Street to SE 27th Avenue to SE Lake Road to SE 21st Avenue. For bus route information visit www.trimet.org/alerts. Monday, July 8 at 7 a.m. through Monday, July 15 at 7 p.m.
Closure of SE Harrison Street between 24th and 26th Avenues for the installation of heavy rail and light rail tracks. Bus stops on SE Harrison Street between SE 21st Avenue and Hwy. 224 will be closed. Buses will be detoured from SE Harrison Street to Hwy 224 to SE Oak Street to SE Washington Street to SE 21st Avenue. For bus route information visit www.trimet.org/alerts. Monday, August 5 at 7 a.m. through Sunday, August 25 at 5 p.m. SE Monroe Street between 21st and 25thAvenues; to construct a large storm sewer, new roadway and new heavy rail and light rail tracks. Friday, August 16 at 10 p.m. through Monday, August 19 at 5 a.m. Weekend closure of SE McLoughlin Blvd/Hwy 99E between SE Washington Street and River Road. The placement of girders for the Kellogg Bridge overpass requires around-the-clock construction work. 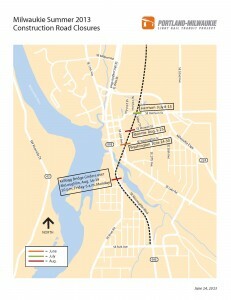 For more information and detour routes, visit trimet.org/pm or call 503-962-2150. For construction emergencies, call 503-962-2222. For service alerts regarding bus rerouting due to road closures, visit trimet.org.